Philip introduces the format of the day. The default is for sessions to be on the record (i.e. externally bloggable) though participants are free to go off the record when and if they want to (in practice, this happened very infrequently during the day). 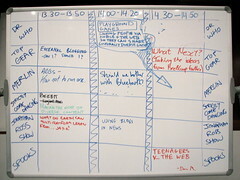 Philip shows people the whiteboard and invites people to add their names and topics they wish to talk about to the board. Having arrived with a slight paranoia that everybody would want to listen but nobody would want to speak, I was relieved to see plenty of slots fill up quickly. We weren’t mad to think that people would have stuff to share. Phew. From now on, the notes I make are predictably dependent on the slot I decided to join. There were generally 2 – 4 other sessions I could have gone to, so I’ll be relying on other people to share their notes to fill in the gaps. Max was previously Head of Design for BBC News and is now the multiplatform editor for BBC 2 and BBC 4. Voice: editorial selection and (sometimes) marketing. Brand. a point of view. Personalisation (choice) via metadata, recommendation systems, personal suggestions. A brand is a promise, re-iterated. On brand affinity, radio does this more often than TV. Fine grained reinforcement. Radio is a bag of sand, TV is a bag of marbles. 2 hours of snooker vs 3 minute song on the radio. Brands with the clearest voice will be meaningful. Choice and voice are extreme ends of a scale. Interesting things will happen somewhere in the middle. “What am I going to watch?” is answered by a TV channel if the voice of that channel means something to you. “I’ll watch BBC 2” if there’s a voice there, so that I know what to expect. It is the role of tech teams not to say “Telly’s dead. Knob off”. BBC as a gateway. What will there be less of? Reasonable prediction that repeats will be less important in a world which has video on demand everywhere. Steve presented a speech on the Common Platform, but it was punctuated by so many additions and asides (and interruptions and questions) that it didn’t feel like an overly formal approach. commonplatform.co.uk – get involved. Tag (delicious bookmarks, Flickr photos, …) write stuff. How do we share code, content, insight, talent and resources? Q: there’s already a common platform, it’s called the internet. A: the BBC has the potential to create a valuable layer in and on the web. We should not duplicate existing services, but we might have to create new ones. The role of the BBC should not only be to slot content into existing models. Providing guidance and value might involve more. Q: is it a specific thing, a destination? A: Not necessarily. More a way of thinking about the world and our place in it. Not being so cowed by the technology that we don’t get involved in improving it. Jo is BBC 3 multiplatform editor and, like me, has been thinking about social TV viewing for a while. What are they doing? Facebook, mobile, IM. i.e. connecting with friends. Idea: live text/audio commentary. Celeb commentators. Talent led. Sarcasm (e.g. examples of Charlie Brooker, Anna Pickard). Insider knowledge. Idea: annotations. Text and graphics. Freeze frame and draw on the screen. Dragging and dropping graphical features. Lovely food and drink sponsored by Simon Nelson. Thanks Simon. I took bad notes about this because I was doing too much of the talking. Rain was taking better notes? personal hosting and personal liability. Good thing or bad thing? could my response to this email usefully be seen by more people? Tom: was recently challenged on why he wasn’t making time to blog more. Can we afford not to? Daniel is at the College of Journalism. 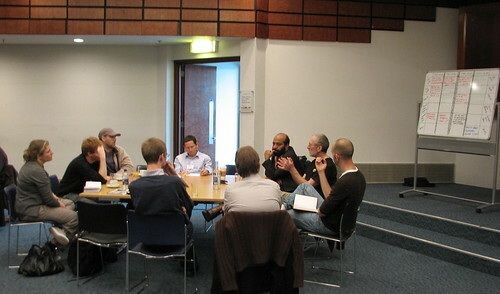 He hosted a conversation on the role of journalism in blogging, and blogging in journalism. Liveblogging. Sport does this (but doesn’t call it live blogging. It’s ‘live text commentary’). News doesn’t. Idea: why aren’t foreign correspondents on Twitter? (From Our Own Correspondent model). Daniel Morris: Ambient journalism. Blogs like Amazon (and Last Chance To See) as production diaries. Scope for doing something like this in news? 3:30pm – Tom Van Aardt: What Next? Tom asked, where do we go from here? Should we run more of these? Jason DaPonte’s notes on The BBC’s first MMOG (massively multiplayer online game), What is the Common Platform?, How NOT to run an Alternate Reality Game, Does the BBC need a games strategy?, Should We Bother With Bluetooth? 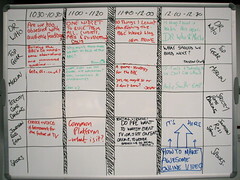 Daniel Bennett’s notes on Are we obsessed by audience feedback?, Global navigation on the BBC website, Ten things I learnt about the Internet Blog, Online Video, External/Internal Blogging by BBC people, Using Blogs in News (his session), What’s Next? I like the Social Viewing ideas. It’s an extension to the coming in to work and having the “did you see…last night” conversations. That’s why Big Brother and The Apprentice work so well. Even a simpler thing of just being able to see what my friends are watching right now, last.fm for TV would add so much. If I knew that 3/4 of my friends were watching something now, I’d turn it on whatever it was. The live blogging of cricket works really well. It’s actually really entertaining as much as it is informative. I often have that on as I’m watching/listening to the game. My Dad used to do this in the olden days with Test Match Special on the radio to get the commentary of the game on TV. It works less well when they do it in football as the game happens too quickly, so they have to focus on the key facts, informative, but dull. Journalists using twitter or blogs about a story they’re covering may not add much to the actual mechanics of the story, but I think it would enhance their credibility and reliability from an audience perspective. People are so guarded about what is real and what’s spin or propaganda. Blogging or using Twitter as they were investigating the story would add to the perceived reliability of the final published story. I’m very pleased that despite the glacial rate of change of the public facing stuff, the people inside are thinking a lot of the same things we outside are too. The point about repeats is perhaps less true than we realise. People watch repeats because they’re on at the moment. If they trust the voice of a ‘channel’, they may watch a repeat because it’s on, or even because of other better reasons – to revisit events that have bearing or reflect on topical things or to observe interesting parrallels between different works of art. VOD is important, and will probably become the major mode of TV consumption, but I think there will always be a need for a continuous feed of curated content. At the moment, we lack the structures to do this well – there’s not enough content on the few channels we have to have meaningful curated continuous streams, we need cross network (and I’m including youtube here as a network), players that can be guided by reputation, voting, or curation streams, and access archive material. The guidance streams need to be democratic and user controlled. If we get these systems in place, reputation will be more important not less, and there will still be a role for BBC curators, commentators and journalists if they provide significant value. I was very grateful to receive an email last week from Chris Hamilton who is an assistant editor, production for the BBC website. He made an important point about news and blogging which ended up being slightly misrepresented in our discussions at BeebCamp. 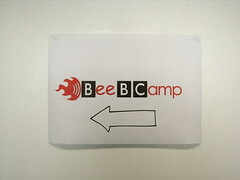 I signed up to Beebcamp but unfortunately couldn’t make it yesterday [now, last Tuesday]. Was just skimming through the notes at rooreynolds.com and alighted on the line from your bit about Sport’s live text commentary and the fact news doesn’t do them. In fact we do run such pages, modelled on the Sport approach, with the most recent last Friday for “Downturn day”, though the series done for the US presidential debates are probably better examples. They’re also done weekly for prime minister’s questions. The next big one is planned for US election night next week. Some links below. They’re obviously not blogs in the true sense, and are quite labour intensive, but are popular and now a significant part of our coverage, when the event is right, although we’re still feeling our way with them. As I replied to Chris, I’m not sure if I said news doesn’t do any form of liveblogging. If I did, I was thinking of the sort of liveblogging that you can do with software like CoverItLive. The informal nature of the conference meant that sometimes people brought different ideas of what blogging is to the table (though this in itself was interesting). I didn’t mean to under-acknowledge some of the stuff Chris has kindly pointed to above. Thanks Daniel, and Chris, for that clarification. Glad you were able to improve on my quick summary notes and set the record straight.